ALPHARETTA, GA – April 27, 2017 – Downtown Grand Hotel & Casino (Downtown Grand), a newly renovated urban resort located in the heart of downtown Las Vegas, has bolstered its revenue management processes and profitability through the successful implementation of The Rainmaker Group’s (Rainmaker) guestrev® solution. Downtown Grand recently deployed guestrev® to more accurately and strategically set rates and pricing for various guest and player segments, by analyzing total guest value to the property. guestrev® is built on Rainmaker’s total guest valuation methodology, that analyzes guest spend for the entire property or enterprise, including room, gaming, entertainment, F&B, spa, retail, etc. guestrev® ensures that room rates reflect not just a guest’s expected room revenue, but also the total profitability of each guest segment, including various player levels in the casino. Sophisticated optimization algorithms factor-in both revenues and costs, resulting in top- and bottom-line growth and rapid ROI after implementation. 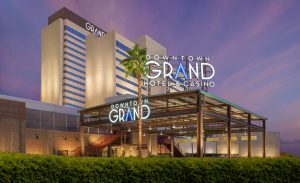 When the Downtown Grand’s revenue management team first began the process of selecting a revenue management technology provider, they focused on finding an all-encompassing solution that would not only aid in yielding rates, but one that could also easily integrate with the property’s existing casino management system and PMS. This was a major focus for the property, as its primary need was to implement a solution that could integrate data from both systems to provide a comprehensive view and understanding of guest value, by segment and individual spend. After looking into a competing platform, the Downtown Grand turned to Rainmaker for several reasons. Most importantly, the Rainmaker team was able to create a seamless integration between guestrev®, Downtown Grand’s PMS, and its gaming system. In addition, Rainmaker’s impressive track record throughout nearly two decades in business and the level of customer service and support that was provided during the entire process were of equal importance for the Downtown Grand team. Since its initial implementation in Q1 2017, guestrev® has already proven effective in helping the Downtown Grand team identify the specific revenue management strategy and pricing challenges that needed to be addressed. In addition to immediately increasing overall property profitability, the solution has also generated cost savings by reducing on the time it takes to analyze multiple data streams, including data that shows where guests are spending their money. This allows properties such as Downtown Grand to create pricing strategies specifically targeted to certain guest segments and based on total guest value. About Rainmaker | The Rainmaker Group is the premier provider of revenue and profit optimization solutions to the hospitality and gaming industry. Since its inception in 1998, the company has focused on delivering the highest revenue returns possible for its clients, through the development and cultivation of a proprietary suite of products and consulting services. Following a 2017 acquisition of its multifamily assets by RealPage Inc., Rainmaker is 100% focused on the hospitality market, with solutions designed to streamline operational efficiencies, enhance revenue optimization processes, improve lead performance and generate greater demand. Recognized as one of the top privately held companies in the United States, Rainmaker has been named to Inc. 5000’s Fastest Growing Privately Held Companies for the last six consecutive years, and was named to the Atlanta Business Chronicle’s List of the 100 Fastest Growing Companies in Atlanta. With corporate headquarters in Alpharetta (Atlanta), Georgia, Rainmaker also maintains offices in Las Vegas and Singapore. To learn more about Rainmaker and its suite of profit- and demand-optimization solutions, please visit www.LetItRain.com, and follow Rainmaker on Facebook, LinkedIn and Twitter.